civic education and public outreach, and advocacy for an improved electoral framework. PACE was established to engage the 2015 elections in the short term and to establish a formal election focused organization which will be able to engage the whole electoral process in Myanmar in the long term. 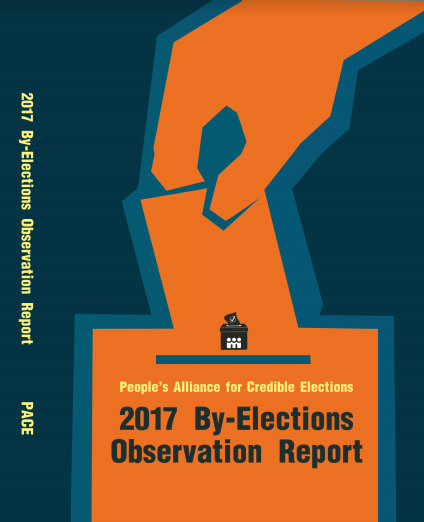 On election day, PACE observers deployed in pairs to a random sample of 301 locations nationwide as part of PACE’s sample-based observation (SBO) effort. PACE also deployed observers in pairs to over 550 additional locations nationwide. More than 18,000 points of data were collected over the phone from observers to over 60 call center operators and PACE staff in Yangon. From 5:00 am on election day to early in the afternoon on the next day, PACE observers reported on the setup of polling stations, the voting and countingprocess, and the announcement and posting of results. PACE was able to collect and analyze data in time to hold a press conference less than 24 hours after the polls officially closed and prior to the UEC’s release of official results. 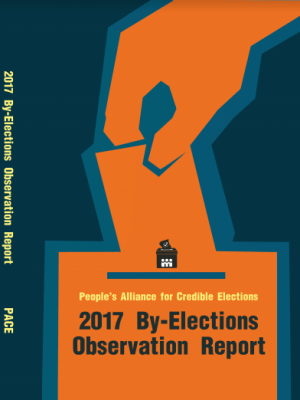 PACE’s groundbreaking work provided Burmese citizens and international observers with the only timely, statistically representative data about election day procedures in the country’s history. Seventeen network coordinators stationed in every state and region served both as master trainers and supervisors for long- and short-term observers. Twenty-two long term observers deployed for the 60 day campaign period to monitor both the pre-election period and act as supervisors for all Election Day observers. This graphic is based on the deployment of PACE’s 602 SBO observers to 301 randomly selected polling stations, ensuring a statistically representative sample of the by-election areas. In January 2017, PACE enumerators conducted more than 800 face-to-face interviews from randomly sampledvillages and wards to gauge the level of knowledge and awareness about the voter registration process and voter list display. Building off their successful observation of the 2015 election, PACE deployed 30 observers to display centers to monitor the two week voter list display period. During the 60-day campaign period ahead of the polls, PACE deployed 22 long-term observers to conduct interviews with candidates, voters, and UEC sub-commissions, and monitor campaign rallies occurring in their designated areas.